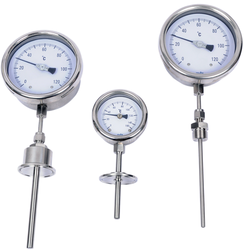 Size: 6", 4" and 2.5"
We are prominent names in the industry; we offer world-class range of Angle Thermometers that are valued for high quality and dimensional accuracy. Our entire product range is abrasion resistant in nature and ensures smooth finishing standards. They ensure effective results and are delivered within the budgetary limit. Mounting : All / Every Angle, 180 deg.